Introducing a brand new collaborative box between three brands who will have one new guest brand each time the box launches. The Shimmer Me box will always contain polishes with a shimmer finish, and this very first box has a Tropical Vacation theme! 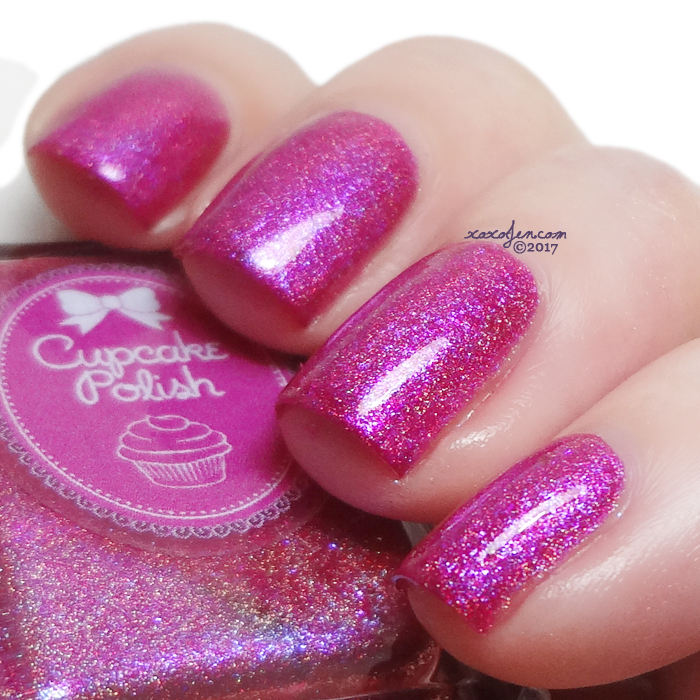 The very first box guest is Cupcake Polish and she's made a stunner, ya'll! Let's get right into it! 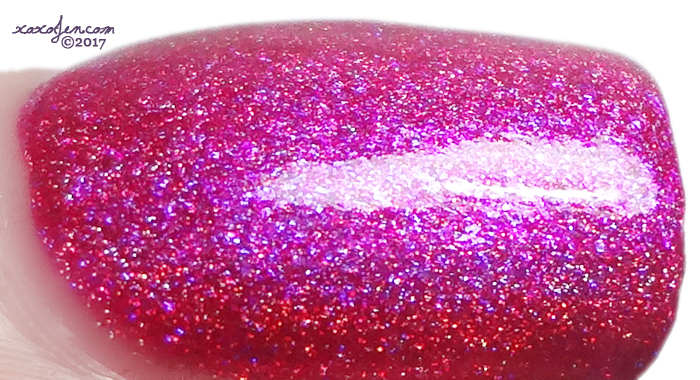 Hello Hibiscus- a cool berry red with blue to pink shifting shimmer. 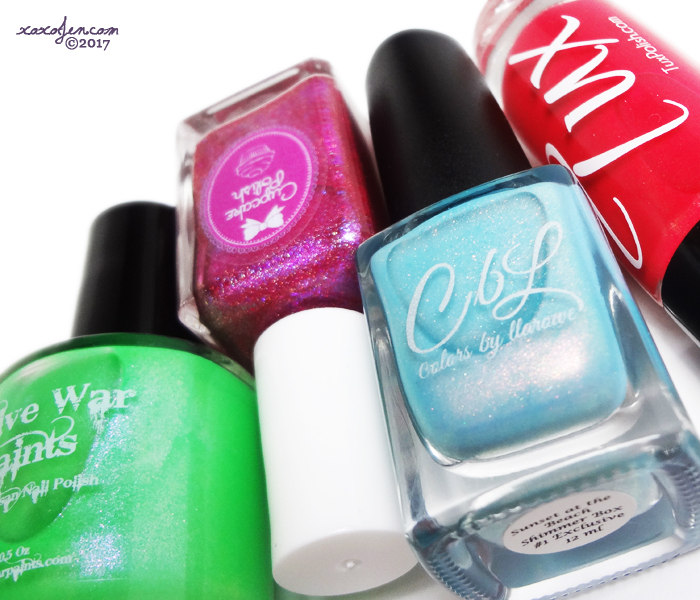 An absolutely stunning polish, jam packed with sparkle and shimmer with a metallic finish! I wore two coats and topcoat, formula was easy to apply. Sunset at the Beach - milky light aqua blue crelly base with red to copper shimmer and a sprinkling of holo for added sparkle. 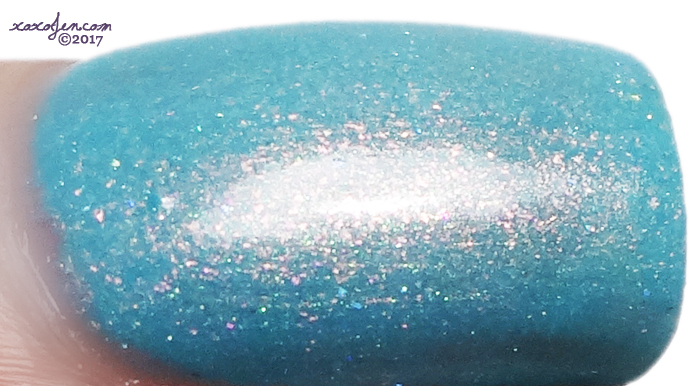 An absolutely beautiful polish, reminiscent of the sunbeams sparkly on the ocean water. I wore two coats and topcoat, formula was easy to apply. 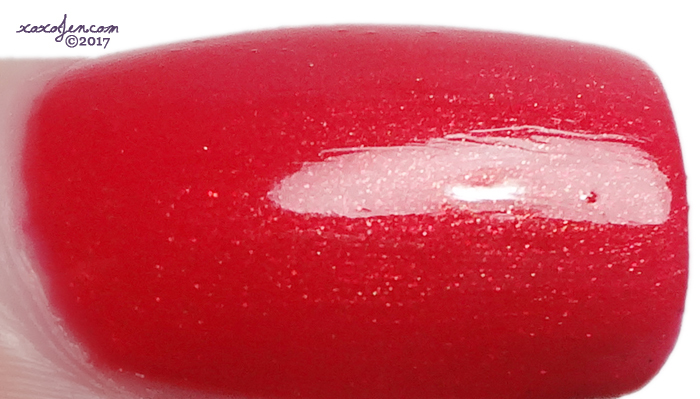 Bay Breeze - Red leaning coral with gold shimmer and micro glitter. Although difficult to see in my photos, there is shimmer in there! It adds a depth and beauty to this polish. I wore two creamy coats and topcoat, formula was easy to apply. Palm Trees and an Ocean Breeze. Teal tinted neon green with red, orange, yellow shifty shimmer. 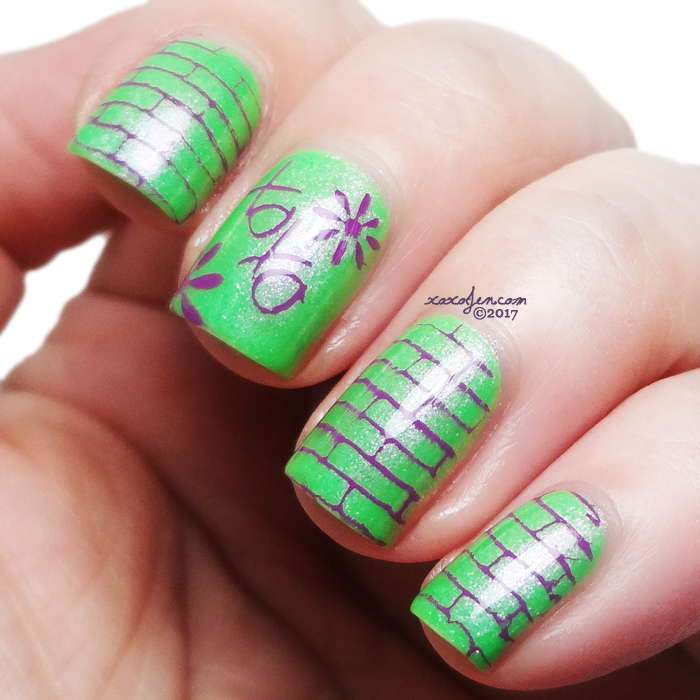 Super bright green, like you might imagine tropical party themed decorations to be. I wore two coats and topcoat, formula was easy to apply. 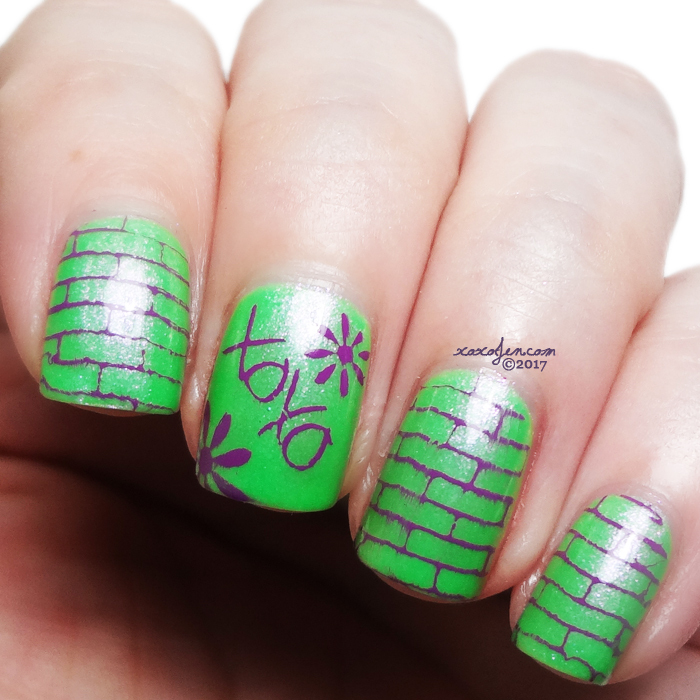 I can't wear a bright green polish and not do some stamping! 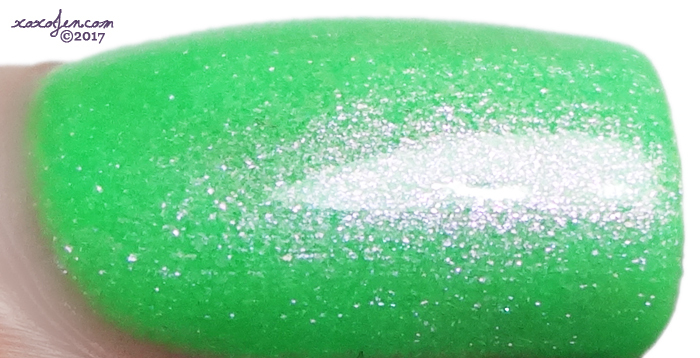 This is stamped with MDU stamping polish and my custom Vivid Lacquer plate VL043. The xoxo was created from my handwriting and the other design are bricks. Topcoat smears make me sad, but those are difficult to see in person - thank goodness! The May 2017 Shimmer Me Box featuring Cupcake Polish will launch on 4/29 at Noon EDT. They will be available at www.nativewarpaints.com. 25 will be available and we will go into a one week preorder after the first 25 sell out. The first 25 will be shipped on 5/2 as I will not be returning from New York until late in the evening 5/1. Preorders will take 2-3 weeks to ship. The May Box will be available to be viewed at Polish Con but all purchases of the Box must be made on the website.